If you follow the usual travel guidelines you will show up to the airport around 2-3 hours before your flight, head straight to check in and get rid if your bags.....sounds about right! I was doing the first flight from Melbourne to Dubai by myself with Madison so I was terrified!! I think it was pretty obvious because everyone was so nice!! I checked in my bags, requested a bassinet seat and asked if I could check the pram in at the gate.....tick, tick and tick....all going well so far. Now I had a few hours to kill, went and had some food and thought I would go through the departure gates early so I had plenty of time to get through customs and security, well turns out I didn't need it! Went through to security, was spotted with a pram almost straight away so was lucky enough to jump the queue. The security lady took me to my own line, saw that I was by myself so stayed to help me. Unfortunately prams have to go through the scanner so I had to take Madison out, show the lady how to fold up the pram and walk on through. There was another lovely lady on the other side of the screening point waiting to help me again, she helped unfold the pram, helped put my stuff back in my bag and then helped me put Madison back in, I basically just stood there. Then I was SO happy to be given a fast track card so I could walk through the fast track line at customs. This is the line the flight attendants go through and anyone who needs to get through quickly, again.....SO HAPPY!! So the 2 hours I gave myself to get through security and customs and find my gate was so not needed. Found the gate straight away and thought.....what am I gonna do now??? I ended up being taken down the lift to the boarding area early so they could take the pram and I could board first. All the blogs I read before I left told me not to board first, means that the little one spends even more time on the plane than needed. I was hesitant but went on board early anyway. It gave me a chance to get my seat, get my stuff organised and meet pretty much every flight attendant. They were all so lovely and all said they were there to help if I needed it. They gave me the baby seat belt and then basically everyone else started boarding. One thing I want to mention though, not all airlines will let you check your pram in at the gate, if that's the case please don't worry! Most airports have loan prams that you can borrow both before you get on the plane and once you get off. You can take them right up to the gate and they are right at the gate when you land as well. If you do get to pick up your pram straight off the plane maybe wait until last to get off, means you won't have to stand their holding your baby until they bring it up, sometimes it takes them 20 minutes to bring it up. Just as you step out of the plane into the tunnel that connects to the building, there is a door right there with stairs that lead down to the tarmac, that's where they bring the pram up for you, so just wait by the door. Who knew they were always this helpful??? So you're on the plane, quietly starting to freak out that you're stuck there for 14 hours with potentially a very unhappy baby. Well never fear because you will get off at the other end and it will all be over!! 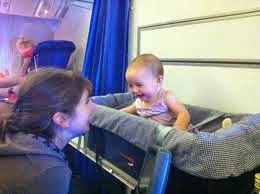 There is an end to your flight and your baby will sleep so don't worry! I had the bassinet seat which I was super hopeful would work perfectly, Madison would go to sleep in the bassinet and I could have a rest too and in a few hours we could play then go back to sleep, boy was I wrong! If your baby hasn't slept in a bassinet ever or for a while there is a very small chance they will sleep in the bassinet on the plane. Madison never slept in a bassinet, not once, so how stupid was I to think she could sleep in one now! It was good to give both her and me some space though. ATTENTION ALL AIRLINES: I understand that a bassinet needs a wall to support it, and that the seats behind it need some more leg room but can I tell you......the front of the seating area is the WORST place to put a bassinet!! If your kids are anything like my daughter they have a massive fear of missing out. So instead on relaxing in the bassinet or even on my lap and going to sleep Madison spent all her time looking around and talking to people. Remember that wall I was talking about to support the bassinet, well that wall is what separates the seating from the toilets or the kitchen, so yes.....the busiest part of the plane! There was a constant stream of flight attendants walking passed or starting the food run as well as a constant stream of people going in and out it waiting for the toilet......seriously the worst spot to put a baby when you are trying to calm them down for a sleep. And because it's a baby everyone wants to say hello and chat, as lovely as that is I'M TRYING TO GET HER TO GO TO SLEEP!!! Next time airlines, find a spot at the back of the plane in a much quieter spot, or automatically give parents with babies an upgrade to business for a quieter flight with more room. Yep I'm gonna go with that option! We found that on smaller flights that weren't as busy we request a spare seat next to us. Madison was never going to sleep so we gave her a seat so she could have her own space, lay the tray down, give her some toys and there you go....entertainment and space for a few hours! It wasn't always that easy but when it was it was great. Another thing that I came across was the brilliant idea from British Airlines. They gave you the option of having a flat bottom bassinet or a seat. The seat goes in the same spot as the bassinet and it kind of looks like the seat in her pram from home. It lays reasonably flat or sits up and you strap them in. Brilliant!! I grabbed the seat, strapped her in so she couldn't get out, let her play with her toys and I watched a movie.....again Brilliant!! Nice job British Airlines. So now that's settled let's move on to the rest of the flight. Food was always difficult for us. Madi would eat her food fine but when I had some put in front of me, or the people next to me got food all she wanted to do was grab at it. I tried putting her in the bassinet while I ate but all she did was try and climb out, so yeah food time was fun. I always gave her food when I was eating, tried to occupy her as much as possible or distract her with some toys. One of the flight attendants came and played with her for the 5 minutes Madison would oblige so I could eat. That was fine but then they took forever to clean up the left overs, I understand that is how it works....another reason why the business upgrade would be ideal! As for Madison's food though, I was worried about what I could and couldn't take on and take off the plane, but to be honest, if you have a baby they are so lenient. I took a sandwich on the plane to give her for lunch, some biscuits and a few pouches of food. The pouches were ideal because she could such the contents out herself and would be almost full. I ended up refusing a lot of my meals because 1. Just too hard and 2. I hate plane food. She was also still having milk, not formula but full cream milk at this point. In the weeks leading up to the flight I transitioned her onto cold full cream milk straight out of the fridge. I wasn't sure if I would be able to warm up her milk while we were away so figured if she can do cold it would be much easier! I ended up buying some of the long life full cream prima style drinks, each prima had 200ml of milk which was perfect. I tried to get her drinking from a straw but that just wasn't working so I wrapped the primas up in glad wrap separately then put them in a snap lock bag. Extra protection just in case. Then when she needed milk I would unwrap, poke the straw through and pour the contents into one of her bottles, done! She took them really well which was amazing and helped her drift off the sleep a few times! For the times that she was asleep she slept on my chest, I would just lay the seat back as far as possible and snuggle in. Worked a treat. For the times she was awake she played with everyone and everything, she never stopped moving which made it hard but otherwise we got through it. And let me tell you.....just use the phenergen. It's kind of like when you're pregnant you keep saying no I don't want the epidural, then when your in labour your screaming for them to give it to you. Just go in with an open mind and do what ever makes both yours and your child's life easier. Remember as well that after a few hours your child will start to get so upset because they can't go to sleep, they need as much help getting to sleep as we need getting them to sleep, so it's a win-win! Before we left I had a visit with my doctor to make sure Madison was 100% healthy and to ask a few travel questions and make sure I was fully prepared. The advice I was given was that my biggest issue going overseas was gastro, and yep she was right. Madison had gastro for a whole week of our trip, we were in the beautiful Canary Islands and couldn't even go for a swim! It was tough but we got through. One thing my doctor did advise was to take some hydro lite with me, just to keep her hydrated if she did end up with gastro. Unfortunately this is something I forgot about in the lead up to going away so was cursing myself when she got gastro. I just kept up the fluids a much as possible. I was only giving her bottled water and for a bit I was boiling the bottled water in the kettle and letting it cool before I gave it to her, just the extra precaution. People always say don't drink the water when you go away and half the time it's fine, but for babies that's a must! Their little tummies are a lot more sensitive than ours so make sure you stick to that rule! Food was always hard, the baby food in the supermarket wasn't great no matter where we were, she could eat our normal food but when you go out for breakfast lunch and dinner at was hard giving her variety and making sure she are all her meat and vegetables. Fruit was easy, she had a heap of that, the jars or fruit were fine and we would buy fruit at the supermarket, only fruit with a skin that we could peel off, like a banana or kiwi fruit or even oranges. Yogurt from the supermarket was also good and easy, just make sure there is room in your bar fridge for it first. We were lucky enough to have buffet breakfasts supplied at a few of the places we stayed, I made sure that I grabbed a yogurt and some fruit on my way out each day, the hotels don't mind and saves you a bit of money and a trip to the supermarket. As soon as we got to each new place I would find the closer supermarket and go pick up the essentials; nappies, wipes, bread and milk. Again make sure you could fit the milk in the bar fridge. Another option which we used quite a few times was filing up the empty milk bottles at breakfast as well, means she gets nice fresh milk each day and saved us again a few dollars and a trip to the supermarket. The buffet breakfasts were great, we could pretty much stock up for the day, I occasionally grabbed the jam spread for her sandwiches as well, they are just the single serve spreads but worked a treat and a lot easier to carry than a jar of strawberry jam! Another trick I had was a way of cleaning the bottles, because let's face it your room won't have a dishwasher! I grabbed one of the travel size liquid containers and filled it up with dish washing liquid, brought along a spare toothbrush and used the bathroom sink and hot water and voila.....clean bottles! After I asked for a kettle in a few places I would fill the bathroom sink up with boiling water say, once a week, and let the bottles submerge in the boiled water, I know it's not the same as how you would sterilise at home but it was just an extra precaution on top of scrubbing them clean. If you forget your toothbrush don't worry, just grab the one from the hotel, almost all of the hotels we stayed in had a dental kit in the bathroom, super easy. I found in some places the nappies weren't the best but they did the trick. Also make sure you bring a huge amount of nappy rash cream, Madison had a few red spots each time we went through different nappies, nothing bad at all but I made sure I got then quickly before they turned into anything worse. So after all of that was sorted out we had an amazing time on our holiday, we were lucky that she decided to sleep in her pram on days we wanted to go sight seeing, we took along one of our light blankets and dropped it over the front of the pram, just to help her sleep, nothing to look at therefore nothing to do but sleep. The cobblestone roads helped her sleep as well....nice thinking Italy! I apologise that there aren't many photos in this post but I believe there is some really great advice in this post and hope that it can be helpful to many people. 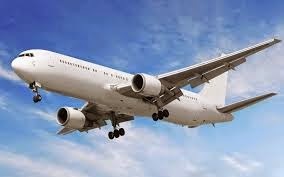 If you are flying with a little one it will be fantastic, just remember a few of my hints and tips and you will be fine. 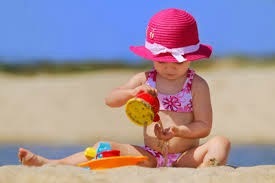 Remember the most important this is for you not to stress, if you relax and enjoy it so will your baby!